Need to assure real issues that are pinpointed in the WMP are addressed, not only the citizens’ concerns, but experts’ concern. I do understand the UMP will be to identify and document; and suggest remediation of non-point source issues, but concerns still exist in my mind and wanted to make sure they were disclosed previous to the Plan’s submission to IDEM, OEPA & USEPA. Do not address enough of the cultural differences and diversity in the plan. People may not be realizing how many Amish are in the watershed. Missing: Not so much the CAFO but the “sub” CAFO – the CAFO’s that DO NOT exceed any limits on any one animal. They combine them and do not exceed regulatory. Impacts are far more than the CAFO’s because they are heavy on using and illicitly discharging into the waters. Management on the ground – diverse populations – many are resistant, many are supportive – due to religion they may be exempt and should be considered in the implementation so we do not fail. Character of landscape, not there in the St. Marys – very strict Amish boarders – NEED Amish “insider” to help with the process! Inputs are measurable like Ft. Wayne Utilities – what is coming out of the cities not just the treatment plants. What gets flushed out of the storm drains that is NOT measured. CSO IS measured – regular storm drain is just EXPECTED to get better over time. Septics in Defiance County – cut arounds in the plan – cultural sensitivity – bypass the leach fields and solids and drain straight into a ditch because they do not want to be forced to do current practices because of their religious past. WHY are septics still being considered as an acceptable practice, when 96% of the soils in the watershed are limited? Subdivisions need to be limited in development. Unless you are actually providing city utility service it should not be approved through County Commissioners. If you CANNOT afford to tap into the infrastructure service, you are UNABLE to afford the building permits. Process is broken for the drainage board in keeping the city safe. Review the PROCESS of how the drainage board approves new-build permits. Lightly notes the need for buffers – plan does not get into what should be done to change government legislation. ONLY what kind of practices we can do to help these things. LIGHT= EDUCATE NEED to EDUCATE THE DRAINAGE BOARDS as to the practices they currently use as standard practices. Impervious surfaces contribute to more runoff and increases stormwater that has shown to reduce water quality. While concrete and asphalt increase, vegetation and trees within the watershed decline. The following points seem to avoid water quality improvements because they fail to protect, naturalize, and provide a realistic framework for the watershed. Destruction continues without proper oversight, enforcement, holding suggestions of science based information as suggestions rather than inserting them into Municipality Code, Agricultural Rules, Legislative support of laws created for enforcement. A majority of the time; tree removals only add impervious surfaces or mowed lawn-grasses. These tremendously important resources are removed and replaced with rip-rap, concrete, rooftops, structures and detention ponds. Disease: “Twenty-four percent of Fort Wayne’s tree canopy is being removed due to the emerald ash borer” (Fort Wayne City Council, Karen Goldner, 2010). Development: “Most of the forested corridor around the rivers have been removed” (Plan-It Allen, 2007). Energy & Eminent Domain: Trees are being removed because they “pose a potential threat to power lines and are to be removed” (American Electric Power, 2011). Value: Trees are being harvested because of the lucrative cost of Hardwoods. (Kenny Barker, Top Notch Tree Service, 2010). a. If fines were levied, and collected, when a company discharges beyond allowed permit effluent, the monies can be utilized to truly improve water quality for human health and be a deterrent for further pollution discharges, due to penalties. IDEM Extrapolation from Impaired Water List (2010) lists 2,882 segments that are classified as impaired and fail to comply or not meet water quality standards under the Clean Water Act for; Fish Consumption Advisory (FCA) for Mercury, FCA for PCBs, E. coli, nutrients, algae and impaired biotic community. Further research indicates that impairment may also be causing or caused by; pesticides, ammonia, siltation, low dissolved oxygen, habitat alterations, low organic enrichment, turbidity, pathogens, suspended solids, metals, priority organics, and other inorganics. Were these TMDL’s ever established in 2012….if not, why? Surface waters of the state are designated for full-body contact recreation. All waters, except limited use waters, will be capable of supporting a well-balanced, warm water aquatic community and, where natural temperatures will permit, will be capable of supporting put-and-take trout fishing. All waters capable of supporting the natural reproduction of trout as of February 17, 1977, shall be so maintained. All waters, which are used for public or industrial water supply, must meet the standards for those uses at the point where water is withdrawn. All waters, which are used for agricultural purposes, must meet minimum surface water quality standards. All waters in which naturally poor physical characteristics (including lack of sufficient flow), naturally poor or reversible man-induced conditions, which came into existence prior to January 1, 1983, and having been established by use attainability analysis, public comment period, and hearing may qualify to be classified for limited use and must be evaluated for restoration and upgrading at each triennial review of this rule. which are in concentrations or combinations that will cause or contribute to the growth of aquatic plants or algae to such degree as to create a nuisance, be unsightly, or otherwise impair designated uses. At the Indiana Sustainable Agriculture Conference (July 2014) – CAFO waste is being hauled across the boarders of Ohio, into Indiana. There are only 17 inspectors in the Office of Land to inspect who monitor the estimated 625 CFOs and CAFOs Indiana, in addition to landfills, waste transfer stations, septage haulers, and illegal dumping and illegal waste tire dumping complaints. This has resulted in minimal oversight that has been reduced to every five years in some industries, such as CAFOs, which routinely expose the public and the waterways to viruses and other harmful waste products. IDEM does not have the enforcement ability to maintain records of all applications and operations. There needs to be a nutrient application plan that has proper oversight. The rules appear good on the surface, but the lack of inspectors and funding negate the effectiveness and enforcement of the rules. Rules being developed by the Indiana State Chemist will regulate livestock waste as a fertilizer material, which can be good, disposing of composted waste on farmland rather than using chemicals. However, the rules do not take into account the pathogens in manure. All this makes it important to increase setbacks from homes, schools and waterways and address pathogens in manure to protect public health. Since there are already allowances to spread manure on frozen fields, all of these issues will allow more runoff into our waterways. Rules should include land applications being prohibited in sensitive environmental areas (i.e. floodplains, wetlands) Karst areas should be included as well for State Rules, however there are no karst areas in northeast Indiana. The proposed rule is considering organic to be 35% true manure, yet many other things will be present that would not be “organic”. Due to the passing of Indiana House Bill 1112 – waste from industry can be added to soil and then it is considered “amended,”- even though this material may be a far cry from safe. “Organic” labeling simply means anything that contains carbon, but this labeling seems stealthy to the average reader. SO the labeling “organic” can be used to explain pathogens, residue from feed additives, cleaning solutions and antibiotics. TITLE 355 STATE CHEMIST OF THE STATE OF INDIANA Proposed Rule states organic fertilizer as described in 355 IAC 7-3-2; shall keep and maintain records of all such applications. 355 IAC 7-3-2 “Animal feeding operations that cause a violation of pollution control laws,” will be held to the same standards of CAFO’s and CFO’s from that point on. This is good because it means it will require an NPDES permit, yet without adequate inspectors, how will the public or IDEM know if they are in violation? When the manure is applied? How much/acre is it being applied? What percentage is manure and what percentage is “other organic”? The monitors that are in place to track the levels of heavy metals, ozone and the 6 criteria pollutants, are located 7.4- 10.5 miles upwind of where the plants are located. To ensure that pollutant levels in the area are compliant with the National Ambient Air Quality Standards (NAAQS), the EPA regulates the monitors. As a result of the monitors’ upwind locations, it is no comfort knowing the only air monitors will not be capturing a majority of the emissions from New Haven. When the attendees of the IPFW meeting requested monitors on neighboring properties to track downwind emissions, President and Chief Operating Officer Mark Millet said they “They were committed on putting up monitors.” but denied the installation of monitors off the property, because of the “likelihood they would be accountable for emissions coming from other sources”. When residents left the meeting, Mr. Millet then clarified to a select few (Celia Garza reported October 18, 2011) that SDI would be installing process monitors, which essentially are video monitors, to keep a visual log of smoke coming from the stacks. Process monitors do not actually test emission levels. As we all know, what goes up must come down. Residents are also concerned for the quality of the water in a nearby ditch. It has been requested by citizens over the last several years to have the Bandelier Ditch #3 dredged or reconstructed in some way to help alleviate flooding on both farmland and the local roads. The project has been labeled “SDI”, and was only considered by the Allen County Surveyor, Al Frisinger, when the company announced it was moving in. The first public meeting on the ditch’s reconstruction was held on January 12, 2012. The plan to reconstruct Bandelier Ditch #3 has not been finalized by the Surveyor and/or Allen County Drainage Board. Save Maumee needs to mention that the two SDI properties neighbor The Casad Depot (owned by the U.S. Military), that held a large stockpile of Mercury on its property, and is in the same drainage area as these two SDI owned facilities. Environmental Engineer/Enforcement Officer Jack Bajor, for the water division of Region 5 EPA, was contacted with concerns over stormwater discharge from Superior Aluminum. He began making phone calls to the City of Fort Wayne to receive information on their stormwater permit (INR 200184). The City agreed to investigate the site personally and eventually found that there were no violations. It was determined that Superior Aluminum is discharging sanitary wastewater into the appropriate sanitary sewer and uses process water for cooling. The City of Fort Wayne is, however, reviewing a potential need to adjust the status of the industrial user within their pretreatment program. The natural drain that accepts the discharge water is unregulated by the county surveyor’s office. The natural drain begins on the southwest side of Superior Aluminum, and flows north then east on Edgerton Rd. It travels directly past Casad Military Depot, where several flasks of mercury were leaking for years. A copy of the Environmental Impact Statement (EIS) was requested from Casad Depot and the EPA, but to date we have not received the EIS. Without a copy of their EIS there is no way of knowing for sure whether or not the area is still contaminated. With the addition of the copper plant’s industrial storm water discharge needs, Superior Aluminum’s current discharge permits, and no EIS from the Casad Depot, there will definitely be a need to ensure that the quality of the land and water surrounding the operations are documented, to ensure the health of the community and those downstream. (http://www.globalsecurity.org/military/facility/new-haven.htm). All ditches and natural drains in this area do eventually flow directly into the Maumee River, which have the potential to impact the water quality in the entire Maumee Watershed and Great Lakes Region. With the reconstruction of a ditch that drains into the Maumee River, coupled with the added heavy metal emissions into the air, and the fact that the company would be potentially draining their detention pond into the ditch during flood events, there are some deep concerns for the negative impact this will have on the larger region. How do Mercury (Hg) & heavy metals enter our water and fish? The burning of fossil fuels like coal! Indiana is 96% reliant on coal for electricity needs. Indiana House Bill 1112 passed on February 16, 2011 which will allow industrial waste to be added to soil to then be considered “amended soil” (soil better than it was before). Currently, there are no maximum limits for land application to be assessed (for industrial waste), and no oversight for application! The bill was introduced by Indiana State Representative, Phyllis Pond (District 85). Abigail King approached Rep. Pond at the River Summit in Fort Wayne, IN 2010, and asked her if she is concerned about the toxicity of the soil if no maximum limits are set for the industrial waste? Rep. Pond responded, “Yes, I am concerned about the toxicity of the soil if too much is added.” This Bill is rumored to be written by Steel Dynamics Inc.
Fort Wayne City Utilities also sells their water to many surrounding municipalities. 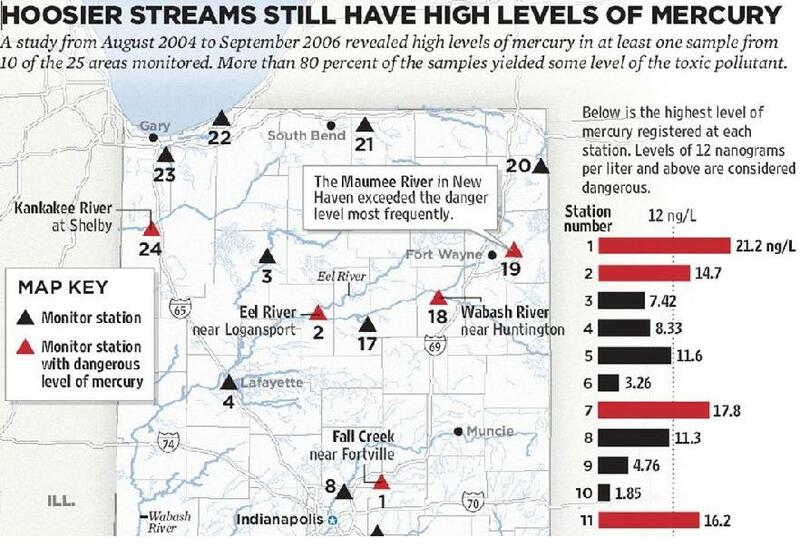 Downstream, (approx) 9 miles northeast of the confluence, lies the most urban area of the Upper-Maumee and remains an Area of Concern (AOC). Much of the land-use near the Maumee River in this AOC is used / designated / zoned as “heavy industrial” and “intuitional”. The settling ponds for Fort Wayne and surrounding cities’ sanitary sewer, is zoned institutional. Many drums have a common nominal volume of 55 US gallons (200 L) and nominally measure just under 34.5 inches (880 mm) tall with a diameter just under 24 inches (610 mm) and differ by holding about thirteen gallons more than a Barrel of Crude Oil . In the US, 25-US-gallon (95 l; 21 imp gal) drums are also in common use and have the same height. This allows easy stacking of mixed pallets. An explicit definition of these drums is not quantified on the EPA website. The Leaking Underground Storage Tanks are being remediated through real-estate law. If a property is sold, the buyer is to remove the LUST before obtaining the title to the property. The LUST are not prioritized by “potential” to leak into the groundwater and don’t include information on contents. For example, a company may purchase “carbon credits,” to compensate the watershed taking away green space. So a company builds a parking lot, but that area has to be replaced with “green space” somewhere else, since it is being taken away. The company then purchases already restored land (i.e. Solomon Farm, Heartland Restoration/Earth Source) to offset the carbon that is added by the company’s construction. This is counterproductive because these areas are already planted and pristine…so the offset is not truly helping the watershed. 4. Marie Delarm Creek (aka. Ham Interceptor Ditch) – Notestine Rd. – large & deep, Amish are east of Lenekers & E. of Bruick Rd. Gravel bed, HISTORICAL: Johnny appleseed had his farm there-, Tusison Creek, Landon Rd. Approach the Union Steward for the City of Ft. Wayne Pollution Control Plant and ask him to do some water testing (please please) he said he will not approve overtime without overtime pay. Speak to Dan O’Connell, director of Fort Wayne/Allen County Convention and Visitors Bureau about how we can help them market activities regarding our local rivers, and the watershed. Rip-Rap has been addressed as a problem for flooding but do not plan to implement anything to address the current Upper Maumee rip-rap areas. LIST of what $75,000 delineated for project budget and projections. Kyle Quant has done a fabulous job only including scientific data collection. * Support legislation that protects natural areas. * Monitor tile outlets, straight pipe outlets, septic systems and NPDES discharge points and document each discharge point to make easily available to the public. * Proper review of permits for corporations including more oversight and stronger enforcement of permits. If fines are issued when a company discharges beyond allowed permit effluent, the monies can be utilized to truly improve water quality for human health. a. Even though large reports are written, it should be outlined and summarized for the average reader to understand. 2. Is water safe for drinking, fishing, swimming, or only intermittent body contact? 3. Monitor water and identify quality problems through our presence on waterways. a. The EPA website for TRI is enormous, so we need to highlight the important information to the public to keep their attention focused on a “sound byte”/ relevant information. proper monitoring and oversight, enforcement is not possible. Identify and remove invasive aquatic species and educate the public on native plantings to improve diversity of fauna and flora. Benchmarking current water quality to exhibit whether water conditions are improving or deteriorating. Provide social media outreach by maintaining email, Twitter, Facebook, Blog Posts & website. the general condition of the watershed land-use, and the major components – by geomorphic, geologic soil and vegetation criteria – in relation to its hydrologic function. the conditions of the riparian areas and how they are functioning. Are there trends in habitat conditions that warrant further study or management action? the probable effect of existing and expected land uses in floodplains and the rivers potential to flow over these floodplains (since the 100 and 500 year floodplains are now having to be redrawn yearly), and sediment production. the watershed conditions – by watching existing and expected land uses that are likely to affect the watershed. For example removing natural areas (unmowed green space) can affect groundwater recharge and base flow. Paying particular attention to likely effects of urbanization. the areas which are particularly vulnerable to watershed damage from potential water pollution sources. Reassess our progress and effectiveness in the Waterkeeper role.